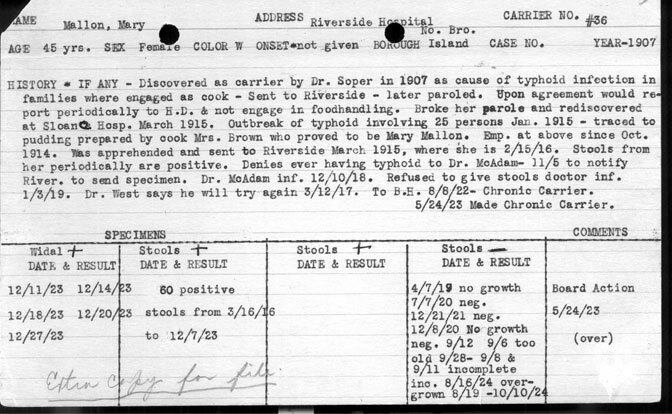 Do I have Typhoid Fever? Do you dream of having your name in the history books? That dream became a nightmare for a young Irish women known today as "Typhoid Mary." In the summer of 1906 at the rented seaside cottage of an affluent banker on Long Island in New York, residents developed weeks of high fever, quiet delirium, abdominal pain, bloody diarrhea, and "rose spots" on the chest and abdomen. 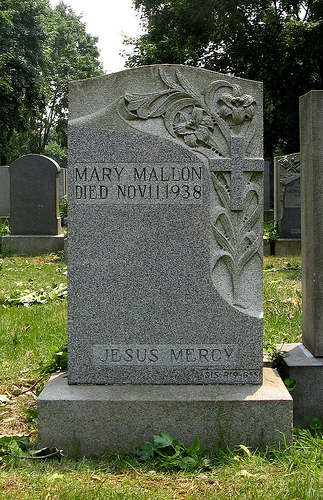 It was the seventh outbreak in a ten-year trail of disease and death left by Mary Mallon, a 38-year old cook who had fled from home to home, infecting entire families with Typhoid Fever. When first confronted, Mary attacked investigators with a meat fork and escaped. She was soon arrested and underwent testing that revealed something new to medical authorities: a healthy but silent "carrier" whose gall bladder had been colonized by the lethal bacterium Salmonella typhi, making her contaminated feces the source of repeated outbreaks. Now a notorious figure, she was branded by newspapers as "Typhoid Mary." Mary fought back. She sued for her freedom and was finally released on the condition that she never cook again. But within five years she turned up again under a false name, working in the kitchen of the Sloane Maternity Hospital on Manhattan Island, where she had infected 25 others, including nurses, doctors and patients. This time Mary was exiled from humanity, her name forever synonymous with the dreaded disease. Typhoid Mary died in 1938 on tiny North Brother Island, having infected fifty-three people, resulting in three deaths. Throughout her life, Mary believed she was innocent of any crime. Today, Typhoid carriers are easily cured -- but our globalized society has empowered new diseases that can turn any unsuspecting individual into a public health threat. Will your name make tomorrow's headlines? 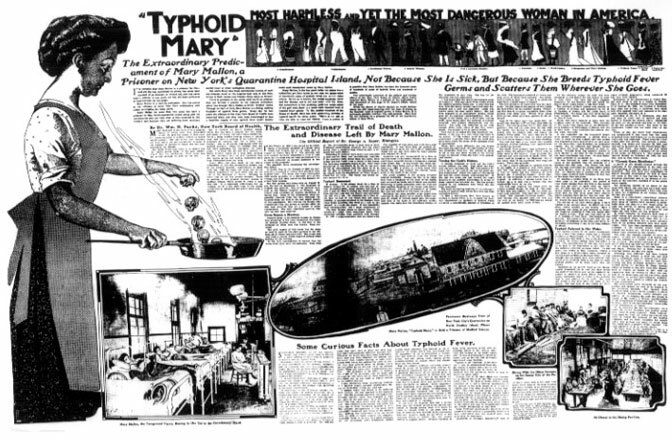 Could you be the next "Typhoid Mary?" See our Disclaimer. Got a Comment? Contact us at Support@HypochondriacHeaven.com All Rights Reserved.